DATE and DATEVALUE functions – How can we help you today? The DATE and DATEVALUE functions are designed to work together and are used to manipulate date formats. There are a number of scenarios where this is useful, such as in a Google Analytics data source. The DATE function converts dates (specified in a given format) to epoch format (the number of seconds since January 1, 1970). The DATEVALUE function converts epoch format dates to the display format of your choice. To learn more about date formats, refer to SimpleDateFormat documentation. The following time-zones are supported in our date and time functions. When specifying AM/PM in the Properties of a column in a Table klip (Properties panel, Output Format field set to Custom), use 't' or 'tt' to represent AM/PM. The DATE function addresses the problem of "meaning" in your data source. This occurs when a data source returns a string of numbers or you need to simplify the date formatting for use in a Klip. The DATE function normalizes your data using an epoch date format. 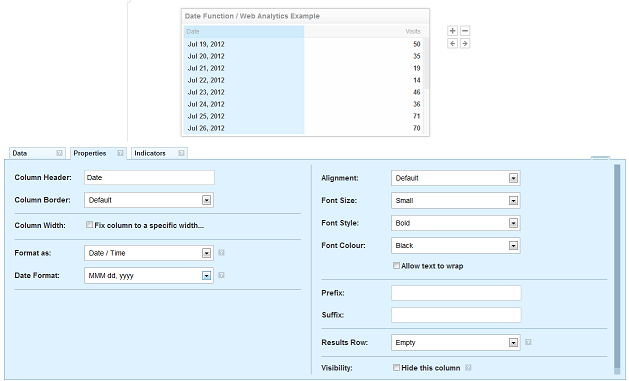 The DATEVALUE function addresses the problem of "formatting" in your data source. This occurs whenever you want to change the way your date appears in your data source. The DATEVALUE function is an effective way to transform an epoch date value into a more standard date format. In the Klip Editor, select a component from the Component Tree. Click Start Formula in the formula editor, then click the Insert Function button on the formula editing toolbar. Select Date and Time > DATE from the function menu. Click the Data link in the DATE function. Select the value or range of date values to include in the Klip. The date values are returned as an epoch. Note: These procedures continue the work started in the previous section. Click on the DATE text in the formula editor. This will select the entire formula so you wrap it within another function. Click the Wrap current value in a function button on the formula editing toolbar. Select Date and Time>DATEVALUE from the Function's menu. The DATE/DATEVALUE functions are useful for formatting dates when the dates in your data sources come in an unfamiliar format. These examples all use nested formulas to format the dates. A common scenario for users working with XML data sources, especially Google Analytics, is that the date appears as a string of values. The DATE/DATEVALUE functions can format this data to appear in a common format, making it easier to see dates in your Klips. Unlike other function examples, these example include instructions because of the complexity of the material. Note: These procedures start in the Klip Editor and use an XML data source retrieved from Google Analytics to build a Table Klip. These procedures only cover steps pertaining to the DATE and DATEVALUE functions. 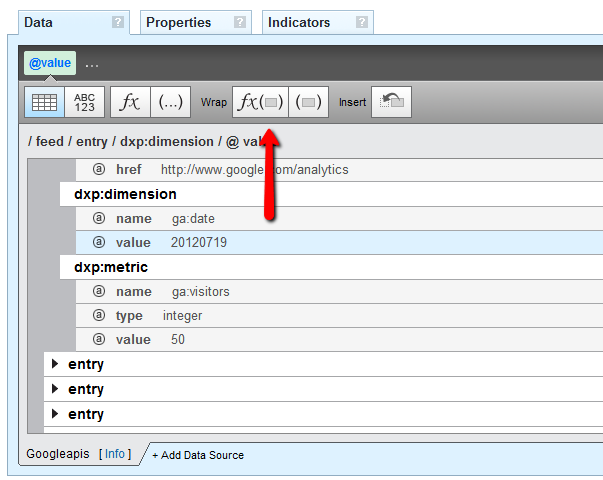 Find the date metric in your data source using the Properties Editor. Note: The date may appear differently depending on the data source you are using. Note: The date appears in the Klip as an array or string of numbers. Click the Wrap current value in function button. Select the Date and Time function category. Click the Format link in the formula editor. Click the Insert literal string or number button. Type yyyyMMdd in the text field. Note: This will return the Epoch date, a literal string of numbers that can used in a number of ways, including, as will be done in the following steps, formatting in a common date format. Click directly on the DATE text in the formula editor. Click the Function Wrap button on the formula bar. Select the DATEVALUE function (from the Date and Time category). Select the Properties tab in the Properties Editor. Change the Format As to Date/Time. Select the MMM dd, yyyy option from the Date Format menu. The DATE function can be used to determine how many days in the past an event has occurred. This is done by setting up an equation that subtracts the current date (using the TODAY function ) from the epoch date (using the DATE function) divided by the number of seconds in a day (86400). Note: The images in this article are from May 3, 2012. How do I use Google Analytics as a data source?